The Rhynil Stop Snoring Spray 3 Pack is one of the best selling stop snoring products available today. It is suitable for sufferers of nasal stuffiness, people with small or collapsed nostrils and mouth breathers. 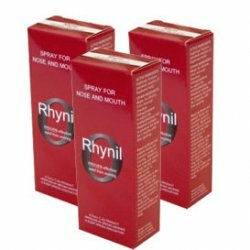 The Rhynil Stop Snoring Spray 3 Pack is made entirely from the natural herb Euphrasia Officinalis and helps you to stop snoring by using its astringent properties. The herbal spray is used to treat snoring caused by 'palatal flutter' and also has added antiseptic and anti-bacterial properties. 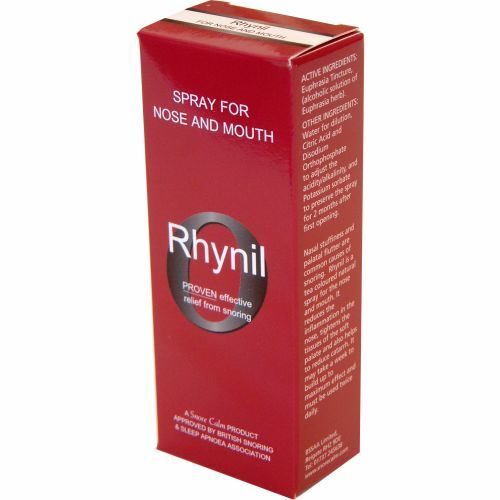 The Rhynil Stop Snoring Spray 3 Pack is very useful in countering infectious conditions in the sinuses and nasal passages and is extremely effective in reducing catarrh and has other unique properties which have a long history of treating inflammatory conditions such as allergic rhinitis. Common household items such as feather pillows, house dust mite, pet hair, perfumes, cosmetics, fabric softeners, air fresheners and insect sprays are all known to cause allergic rhinitis. The anti-inflammatory properties of Rhynil reduce the inflammation in the nasal airway and improve nasal breathing. With the head tilted slightly backwards spray the solution twice into each nostril and twice onto the roof of the mouth. It helps to close the other nostril with your finger. Breathe in gently while spraying. Repeat the treatment last thing at night and first thing in the morning. It may take up to a week to obtain maximum effect. The pump head dispenses approximately 0.1ml per spray. do not exceed the stated dose. Use regularly for continued effect. Store in a temperature range of 10 - 39 degrees Celsius. Rhynil contains 35ml. Ingredients: euphrasia tincture, water, citric acid, disodium orthophosphate & potassium sorbate.